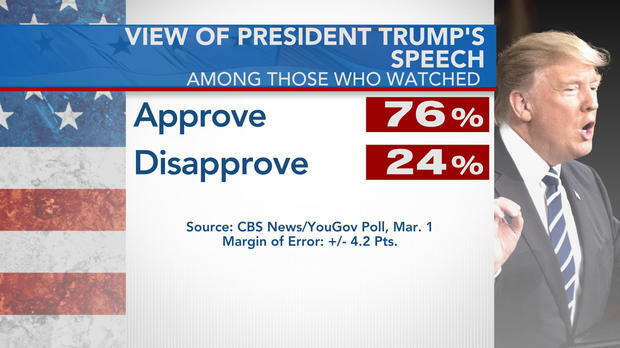 First a CNN poll and now a CBS one, Americans nationwide who viewed President Donald Trump’s joint Address to Congress overwhelmingly approved of his speech. 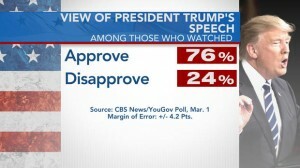 An amazing 76% of viewers stated they approved of his speech, while only 24% disapproved. While half of Democrats found the speech “divisive,” more importantly, about one-third of them also said Mr. Trump was “specific” and “knowledgeable”. No one expected Democrats to side with President Trump, as they have opposed all of his ideas, even the one’s they would normally agree with, but nonetheless sizeable numbers compared to the more negative reactions Democrats have had to other aspects of his presidency. Democrats and the MSM find themselves on the wrong side of the American people as Trump called for unity and for Republicans and Democrats to work together to provide real healthcare reform for the American people. As is often the case in addresses to Congress, those who watched were more likely to be from the president’s party – in this case, Republicans. And they described a president they felt was keeping campaign promises and offering an “inspiring” message. While half of Democrats found the speech “divisive,” about one-third of them also said Mr. Trump was “specific” and “knowledgeable”; neither label drew a majority, but nonetheless sizeable numbers compared to the more negative reactions Democrats have had to other aspects of his presidency. And viewers of all stripes described the speech as at least somewhat positive in tone. Overall, most watchers approved of the speech. Republicans did tune in to watch it in much greater numbers than Democrats (as a president’s party typically does) which bolstered those approval numbers. Forty percent of Democrats at least somewhat approved; 18 percent strongly approved. With the first debate less than two weeks away, and in the wake of Hillary Clinton’s “deplorables” comment and her collapsing on Sunday, according to the most recent CBS poll, the race is a tie. This is a dead even race at this point. In a two-way race Clinton has a two point lead; however, this is not a two person race, there are four candidates and they are all getting support. It is obvious that Trump has the momentum on the campaign trail and in the polls as Hillary Clinton sees her poll numbers and herself collapsing. With the first debate less than two weeks away, Donald Trump and Hillary Clinton are in a tight race for the presidency nationally. Clinton has just a 2-point edge in a two-way match-up among likely voters. The race is tied when third party candidates are included. Among the broader electorate of registered voters, Clinton leads Trump by five points. One disadvantage for Clinton is diminished voter enthusiasm. Democrats are less enthusiastic about voting now than they were in August. More than four in 10 voters think each presidential candidate should release more of their medical records. This poll was conducted before either candidate’s recent release of medical information. With Election Day just under eight weeks away, the race for President nationwide is tight. 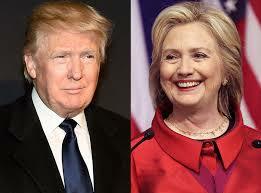 In a two-way match-up, Clinton has a slim edge over Trump, 46 – 44 percent among likely voters who support or lean toward a candidate. In the aftermath of the non-Hillary Clinton email indictment, many polls find the race tightening between Donald Trump and Hillary Clinton. The most recent New York Times/CBS News poll shows that it is a toe at 40% between Trump and Hillary. Mrs. Clinton’s 6 percentage point lead over Trump from last month’s CBS News poll has all but evaporated. Another major problem for Clinton, as she prepares to accept the Democratic Party’s nomination at the convention in Philadelphia this month, is she that 67% of voters say she is not honest and trustworthy. Can you say #Lying, Crooked Hillary. Trump also has picked up some momentum in battleground state polls. Hillary Clinton has emerged from the F.B.I. investigation into her email practices as secretary of state a wounded candidate with a large and growing majority of voters saying she cannot be trusted, according to the latest New York Times/CBS News poll. As Mrs. Clinton prepares to accept the Democratic Party’s nomination at the convention in Philadelphia this month, she will confront an electorate in which 67 percent of voters say she is not honest and trustworthy. That number is up five percentage points from a CBS News poll conducted last month, before the F.B.I. released its findings. Mrs. Clinton’s six-percentage-point lead over the presumptive Republican nominee, Donald J. Trump, in a CBS News poll last month has evaporated. The two candidates are now tied in a general election matchup, the new poll indicates, with each receiving the support of 40 percent of voters.